Dr. Theodore “Teddy” Johnson grew up in Long Island and attended Dartmouth College in Hanover, New Hampshire. He graduated from Ross University School of Veterinary Medicine in 2000, performing his clinical rotation year at Cornell University School of Veterinary Medicine. After a year teaching small animal veterinary surgery at Sydney University Veterinary Centre in Sydney, Australia, he went on to perform a rotating clinical internship year at Manhattan Veterinary Group in New York City. He was an associate veterinarian at Park East Animal Hospital on the Upper East Side of Manhattan before opening his own practice in Long Island in 2005. He has lived in the Colonial Heights section of Pelham with his wife, Danielle, and their two sons for the past 13 years. He enjoys coaching little league, playing tennis, fishing, and skiing. Their family dog is named “Caico”, a one year-old mixed breed that he and Danielle adopted last year in Turks and Caicos. 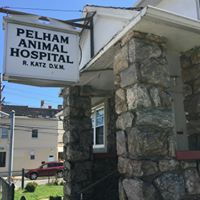 He specializes in canine and feline medicine and surgery, and recently joined Pelham Animal Hospital to work with Dr. Katz in February 2017.